Richard Toensing was born and raised in St. Paul, Minnesota. In his youth he decided that he wanted to create music as well as conduct others performing it. Together, these two passions were the centerpiece of his professional life. Toensing received his B. Music degree with honors from St. Olaf College in Northfield, Minnesota, and his M.M. and D.M.A. degrees from the University of Michigan, where he studied with Ross Lee Finney and Leslie Bassett, two of the great American composers of the 20th century. At both St. Olaf and Michigan, he also received formal training in choral conducting. 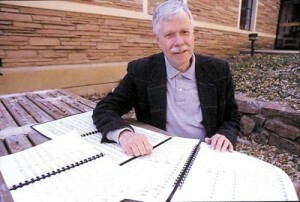 Toensing’s compositions span a variety of styles, from the gestural, free atonal work of the 1960s and 1970s to a renewed interest in various forms of diatonic music in more recent years. He has written numerous works for chorus, chamber music in various genres, and works for large ensembles. His later compositions, particularly from the late 1990s onward, are informed by his careful study of the Orthodox Christian sacred musical tradition and suffused with his deep religious faith. Reviewers of Toensing’s works, sacred and otherwise, have said that the listener is struck by a transparency of sound, a simplicity that exists inside complexity, and a sparkling clarity of parts. Toensing won numerous awards for composition, including the Joseph H. Bearnes Prize from Columbia University, two BMI student composer awards, a Guggenheim Fellowship, and a commission from the National Endowment for the Arts. He was named a MacDowell Colony Fellow three times. To date, Toensing’s music has been performed on four continents, and in such U.S. venues as Carnegie Hall and the John F. Kennedy Center for the Performing Arts. With the help of grants and private donations, he released several recordings of his compositions. His sacred music has been featured on National Public Radio and local stations. In the summer of 1998, the choir at the Church of St. Luke in the Fields in New York recorded the Responsoria, a complete setting of the Tenebrae services sung at Roman Catholic worship during Holy Week since the sixth century. Toensing called this work a “vast, three-movement choral symphony”; it follows in the tradition of several medieval, Renaissance and early modern composers who have set parts or all of the responsory texts. The Responsoria was released as a set of three compact discs in 2000. Cappella Romana, a professional group based in Portland, Oregon, recorded a second major choral work, the Kontakion of the Nativity of Christ, for the Orthodox Christmas season of January 2009. In addition to his work in his studio and the classroom, Toensing served as choir director at Atonement Lutheran Church and Grace Lutheran Church, both in Boulder, and more recently at St. Luke’s Orthodox Church in Erie. In later life, he wrote several pieces intended for Orthodox church choirs. He will be long remembered with tremendous love and great respect.